Summary: Universities have started to offer courses in Mechatronics very recently, but they still lack the infrastructure to help you grasp the concepts fully. For this reason, it is of utmost importance that you pick up a good mechatronics project topic to learn the concept hands-on. Getting skilled in this field is not easy. A number of students face problems in learning and building mechatronics projects successfully due to unavailability of good resources. Mechatronics is a multidisciplinary branch of engineering which focuses on both, electronics and mechanical engineering concepts. It also includes the concepts of robotics, computer science, telecommunications, control and a plethora of other disciplines. This multidisciplinary engineering concept was never before called by the term “Mechatronics” until recently, but we have been studying it since many years now. The washing machine you have in your laundromat is a mechatronic system. Even your vehicle ABS is a classic example of an autonomous mechatronics device. So now that we have established that Mechatronics is EVERYWHERE, let’s understand what we mean by a “Mechatronics Project”. Oh, and the term “Mechatronics” was coined by Tetsuro Mori in 1969. What is a Mechatronics Project? When you apply your knowledge of electronics on mechanical systems, it becomes a mechatronic system. They are being widely used everywhere, especially in upcoming industries, with the rise of IoT. Electronics more often than not, happens to be the core of such mechatronic systems. And having a thorough knowledge of different components and their working often becomes instrumental in the development of mechatronics based projects. Choosing a right mechatronics project will help you get skilled on this technology to a greater extent. Building such good mechatronics projects from scratch would help you to understand the concepts from core and get skilled on it. Universities have started to offer courses in Mechatronics very recently, but they still lack the infrastructure to help you grasp the concepts fully. For this reason, it is of utmost importance that you pick up a good mechatronics project topic to learn the concept hands-on. Instances of devices and systems employing mechatronics technology are found everywhere. When you call the elevator to get to your friends’ apartment on 10th floor, you are using a mechatronics system. An elevator is a classic example of mechatronics technology. The sensors in the elevator system detect the speed, position of the elevator car and the calls requested by the people. The actuators then convert these signals into physical processes. A Crucial part of mechanical engineering is design and production of machines. CNC is one such machine which employs principles of mechatronics. The user has to input codes for performing different operations, which result in a modelled product. This interface between computer and mechanical parts of the machine is the work of a mechatronics engineer. For instance, the CNC online project offered by us uses Arduino Uno as the microcontroller. So you can simply program the Arduino to machine parts with various dimensions very easily. The CNC machine uses a lot of electronic components, mechanic systems and programming logic to function properly. Which again is what mechatronics devices do. Factory automation also heavily depends upon mechatronics for efficient execution. With the sensors being available abundantly, machines are now able to sense the surroundings real time and actuate accordingly. This brings in the industrial efficiency, which a number of engineers working on today. Above are some of the major applications of mechatronics technology. But it goes without saying that as long as there are computers and machines, mechatronics will play an integral part in interlinking both of them.  What are the trends in Mechatronics Technology? If the design of your system doesn’t conform to the latest trend, chances are it will go to garbage, no matter how robust it is. As a mechatronics engineer, you have a very big advantage in this mad race. Industries want fast and efficient production and this is aided by good machines. Machine developers increasingly depend upon Mechatronics to abbreviate the design cycle while ensuring the best possible machines. 1. Biped Walking Robot: Humanoids are soon going to be everywhere, from production lines to police stations. Who knows, they just might be trained to kiss your hand when you walk out of your limo. However, a lot of mathematics just goes into making a robot stand upright. Indeed, a robot is an extremely complicated machine. But it all starts with a biped walking robot. This is a perfect project for beginners. A simple biped walking robot can be made with Arduino, Servo Motors, USB to UART cables and a few other components. With the right course, you shall be able to build your own walking robot from scratch! 2. Robotic Arm: This mechatronics project is a classic example of how industrial robotics function. Often, certain chemicals or physical processes are dangerous in nature, and shouldn’t be handled by humans. This is where Robotic Arm comes to rescue. A robotic arm with 3 Degrees of Freedom can assist us in the tasks that are tough, tedious and tiring. By building this robotic arm project you can control the arm with your smartphone using an Android App. The arm will be connected to the phone with Bluetooth. This project utilizes Arduino Uno, Bluetooth Modules and Servo Motors as the major components. 3. Animatronic Hand: Animatronics is the illusion of life using electronic devices. This helps to recreate a living being’s action and facial expressions. They are widely used in Movies to create life-like creatures. With this project, you will be able to construct an animatronic hand of your own. This project makes use of Arduino Uno, Flex sensors, Gloves and Servo Motors primarily. The course doesn’t require any prerequisites and anyone with basic knowledge in their engineering field can build this project with ease. 4. Hexapod Bluetooth Controlled: A hexapod walks on six legs instead of two and is comparatively stable. It can even walk on rocky and hard terrains comfortably without snapping anything. For this reason, they find extensive use in the current industries. On taking this project up, you would learn about crawling strategies used by such robots and how to program them. Arduino Uno, High Torque Servo motors and Bluetooth module are few of the components used to build this robot. 5. Swarm Robotics: Swarm Robotics deals with the Artificial Swarm Intelligence and involves the usage of multiple Robots which coordinate among themselves to complete a mission. The swarm robots communicate with each other wirelessly and take decisions. By building this project, you will learn about Arduino architecture and its programming, working of dc motors and swarm communication. 6. Fire Fighting Robot: Learn to make a vision guided fire fighting robot that uses digital IR sensors to detect fire and moves in that direction to put it off using a DC Fan. You will learn about graphical programming, motor, motor drivers and Arduino as well by building this project! However, this course is not recommended for you if you’re below 10! 7. Voice Controlled Robot: In this project, you will build a Voice Controlled Robot that can be controlled through voice commands. You will also build an Android App which will understand your voice commands and control the Robot to perform specific tasks via Bluetooth. Therefore, in this course you will learn about speech recognition, android app development, Bluetooth communication and 8051 Microcontroller programming. Excited? So are we! 8. Electromagnetic Brake System: This system utilizes electronic and magnetic power to apply brakes. This helps us to reduce friction, which in turn helps in reducing wear and tear, saving us the big bucks. To make electromagnetic brakes work, a magnetic flux when passed in a direction perpendicular to the rotating direction of the wheel, eddy current is generated in a direction opposite to the rotation of the wheel. This creates an opposing force to the wheel’s rotation and in turn slows it down. It will find extensive use in automobile industry and thus, is a good project option for all the car enthusiasts out there. 9. Automated Drain/Gutter Cleaner: Let’s face it, nobody likes to do other people’s dirty work. Imagine all the sanitation workers out there, who have to do this everyday. They are at a major risk of catching infections. Toxic wastes even pose a great threat to their life. For this very reason, an automated drain cleaner is the best way to go. This system lets the fluids pass, but catches solid waste like bottles and cans. There is even a filter basket on top of it which collects the waste from time to time and dumps it outside. The motor rotates again to go back down, when it starts collecting waste again. This is in line with Swachh Bharat and Make in India, so anyone interested to develop this project is in for a lot of fun! 10. E Skateboard with pressure sensing: Who doesn’t think Skateboarding is cool? Imagine what a skateboard from future would look like. The user just has to lean forward and the motorized board would start to move along once the tilt sensor has detected the leaning motion. The board is fitted with motorized wheels fixed with a belt pulley arrangement powered by an electric motor. The motor is driven by a high capacity light weight battery mounted under the board. This skateboard is not from future, but the very present you’re living in! If you’re a skateboard enthusiast, then this DIY mechatronics project is a must for you. 11. Pedal powered Water Purifier: A lot of us take clean water for granted. There are still a lot of areas in our country that do not even get water. Then there are other areas, which do get water, but not clean enough to drink! Besides, water purification is a fairly costly operation and not everyone can afford an RO system. How nice would it be if purifying water was as easy as cycling, right? Well, it is! A pedal powered Water Purifier solves this problem efficiently. The design and fabrication of pedal powered water purifier includes sprocket chain system with power generator dynamo along with supporting frame, copper piping interfaced with filters, container with integrated heating element and supporting circuit to achieve this system development. The filtered water is boiled to get steam which is then passed through copper pipes in order to drive maximum steam through low temperature copper pipes which provide water on the other end of the pipes. The container on the other end is used to draw pure water from it using a tap. 12. Security and Alarm Project: Who isn’t afraid of their house being robbed at 2 am in the morning? If you’re one of them, this project is for you. This project utilizes ultrasonic sensor for detecting movement. All you need to get started with it is an Arduino Board, Ultrasonic Sensor, LCD display and a buzzer. Automatic Color Sorter: This project will find a wide use in fruit and candy industries. This mechanism uses a camera with electronic circuitry along with sorting mechanism using 3 bins. The system uses raspberry pi connected to a controller circuit to achieve this task. The controller circuit consists of a camera attached to it that detects color of a small object in front of it. A motor is used to feed an object to the camera chamber. As soon as the color is detected a signal is sent to the sorter mechanism which uses a motor to position the sorting tube towards respective section. A feeder is then used to push the object towards the tubs so that it gets sorted and next object is pulled in by the feeder. Automatic Black/White Board Cleaner: It is no secret that chalk dust causes extreme discomfort to teachers and it takes a lot of time to dust off the entire board. This is where this particular project comes to rescue. This system uses a set of frames, brackets, supporting rods, Dusters, motor, rollers and driving circuitry in order to achieve this mechanism. The system is designed to save a lot of time and unnecessary effort needed in cleaning boards. It is designed to clean boards in a less than half the time required to clean the blackboard/whiteboard by a human. For this purpose we use dusters mounted on shafts which are in turn connected on a supporting frame. These shafts are connected in such a way, so as to provide a proper circular cleaning motion that is needed for cleaning the board. Then, we use a motor to drive these shafts in required direction. Suppose, if you want to build great mechatronics based projects but don’t have the necessary technical knowledge, don’t worry! We at Skyfi Labs have developed an innovative learning methodology through which you can learn latest technologies by building projects hands-on right from your home. With the hardware kits delivered to your doorstep and 1-1 technical assistance provided, developing great expertise on latest technologies like mechatronics will never be tough for you.